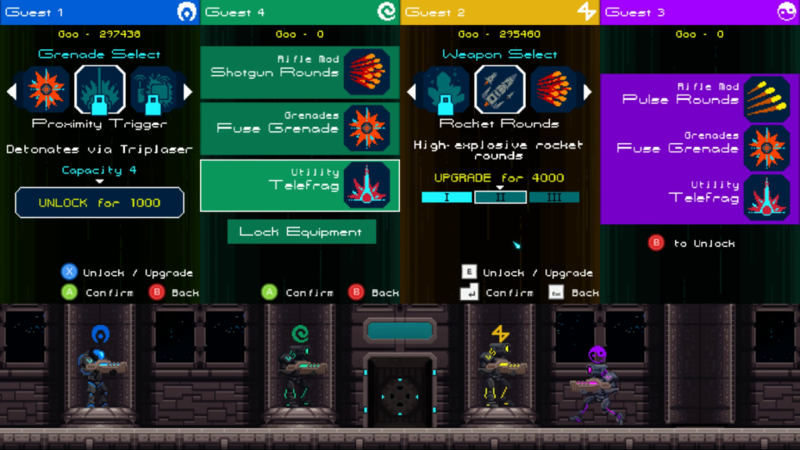 is a sci-fi action platformer for 1-4 players blending run ‘n gun gameplay with strategic campaigns. Get the game on Steam. AVAILABLE NOW! Order using the Humble Widget below! You and your friends assume the role of JUMPERS, and blast your way through subterranean alien hives in chaotic run-and-gun 2D platforming action. 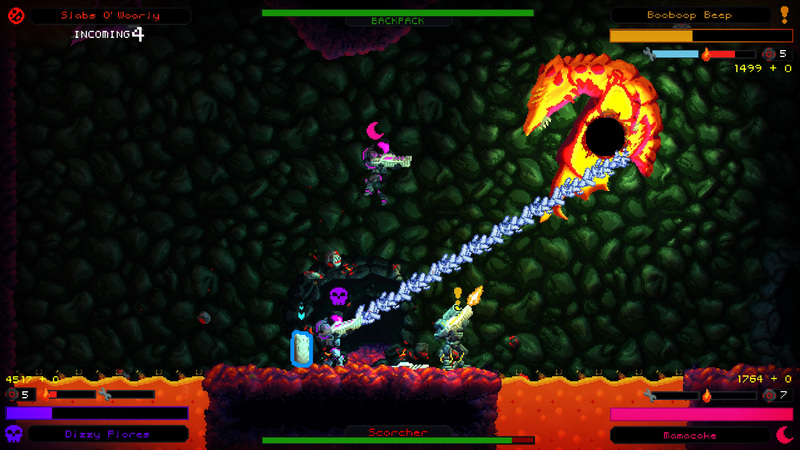 Up to 4 Players band together to kill aliens, avoid traps, collect treasures and lost relics. Win the final battle against the hive queen to save the galaxy! Wii U GamePad Support: Play Hive Jump using your favorite console controller. 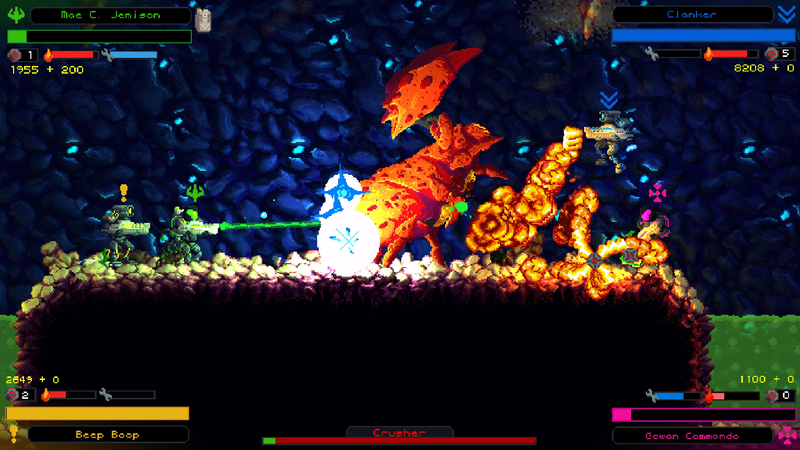 Players control elite space marines called “JUMPERS”. Each mission will place you and your JUMP team at the surface level of an alien labyrinth of tunnels and caves – which are collectively referred to as a HIVE. Your team’s leader carries a Transponder Backpack. This backpack allows your command-ship to beam soldiers and supplies to its location. If your leader dies, the backpack is vulnerable! If it is destroyed, then no new soldiers or items can be sent to your team. Protect it! Each Jumper is equipped with a single firearm that can be modified from a standard pulse rifle to other weapons such as flamethrowers and rocket launchers. Each Jumper also carries a LIMITED QUANTITY of explosives. 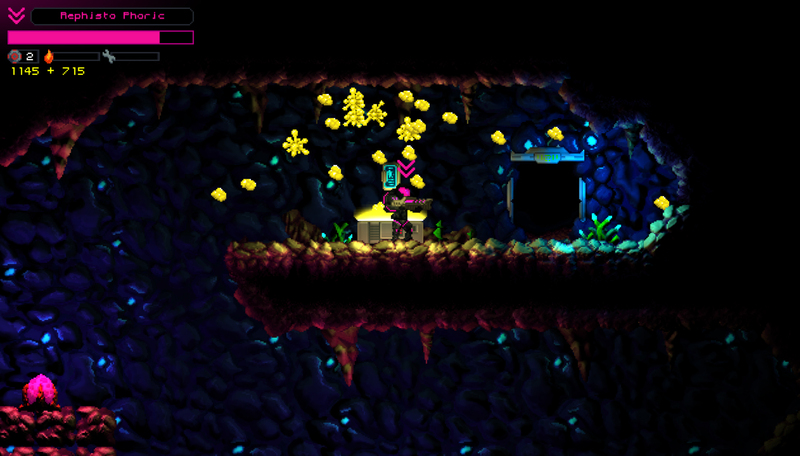 Explosives do tons of damage and can also destroy weaker walls found in the Hive, giving access to hidden areas and treasures. The Jumpers suit of armor will deflect alien attacks for a period of time, but won’t last forever. Abilities to repair your suit can be discovered as you work deeper into the Hives. The Infiltration Suit also has a limited blast jetpack that can activate to give you a boost in the air. JUMPERS can equip different modifications for the multi-gun from flamethrowers to rocket launchers. Each of these weapon types can be upgraded 3 times to increase damage and function. JUMPERS can equip different UTILITIES which aid them in their efforts. Each JUMPER can equip 1 Utility at a time. These range from to defensive items like shields to offensive tools that increase abilities like flight. 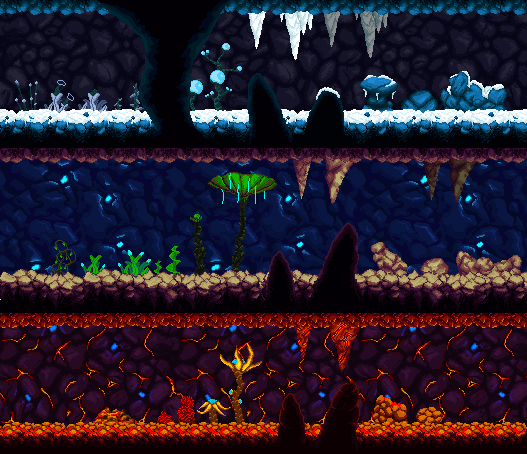 CRYSTAL CAVERNS, FROZEN UNDERGROUND, VOLCANIC WASTELANDS, MUSHROOM FORESTS – these different biomes play home to the different activities of the alien infestation and must be cleansed to restore order to the planet! The crystals within these tunnels are constructed by alien drones from the gooey bio-organic material they secrete, and serve as a power source for alien interstellar travel. These icy caverns are used primarily for cold-storage of large quantities of unhatched alien eggs. These hot sections of the hive are used to quickly hatch eggs from cold-storage, to temper the carapaces and bladed claws of the warrior class aliens. Even though the Ordovicians are fearsome combatants, they are not carnivores and sustain themselves almost entirely on fungus. The Ordovicians are a hostile alien race governed by queens in a hive society. The alien race outnumbers humanity a million to one and has no intention of sharing the galaxy with humans. First-contact resulted in the butchering of a human colony and has put mankind on the defensive against this new enemy. 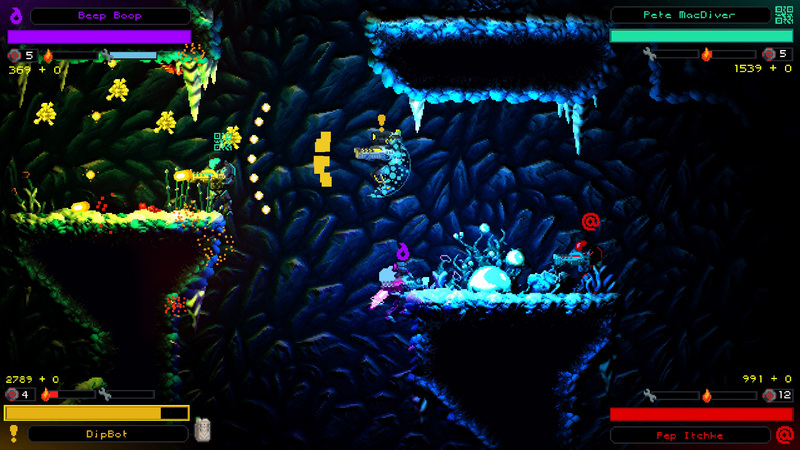 The aliens hunt you throughout the hive, traversing the difficult geometry with ease. Their goal is to stop you at any cost and destroy the transponder backpack. Enemies come in 4 classes: mini, minor, major, and elite, each getting progressively stronger and more dangerous. When an alien hive is successfully cleared, it affects your ongoing planetary campaign! It’s up to you to decide where to strike next, what upgrades and weapons will guarantee your success, and where to build up defenses against the alien counter-attacks. In this “XCOM Lite” style campaign mode, you have to carefully balance your two available resources: Jumpers and Alien Goo. 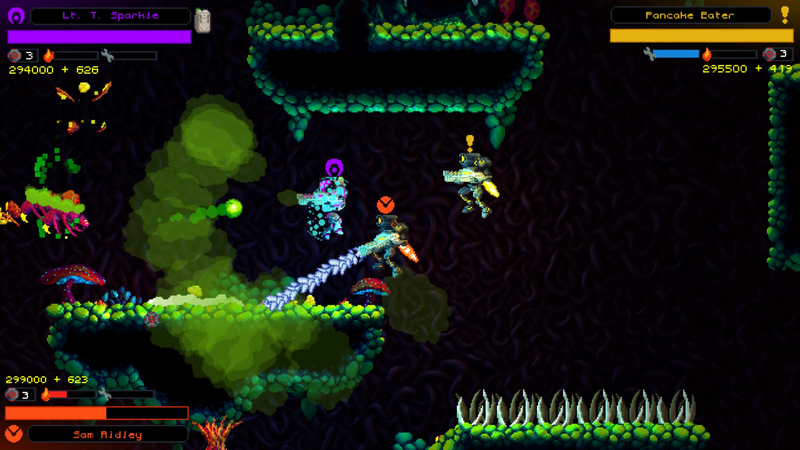 Alien goo is a powerful supply of bioelectric energy, and can be used to requisition new weapons, research upgrades, build fortifications, and request more Jumper reinforcements. Some planetary campaigns are more difficult than others. Difficulty determines the number and strength of hives, as well as the quantity of resources given at the beginning of the campaign. After each JUMP, the aliens have a turn to retaliate. The aliens can expand to new territory, fortify their hives, and launch attacks on your bases. It’s up to you to make sure they don’t succeed.